The annual Melbourne Wine Awards Lunch is continuing on the success of the 2015 lunch, with a convivial afternoon set in the stunning industrial warehouse Two Ton Max, North Melbourne. 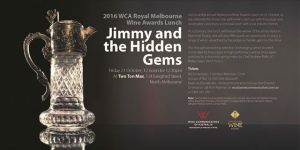 The lunch, on Friday, October 21, will celebrate (and serve) the winner of the revered Jimmy Watson Memorial Trophy, as customary, but for the first time guests will also enjoy wines nominated by the judges as ‘hidden gems’ in the show. We will assemble a range of emerging ‘wines to watch’ – exciting new generation producers, modern classics, interesting blends and thought-provoking wines the judges felt performed particularly well in the show (achieving high points scores). Chef Andrew Blake, of Blakes Feast, will serve up a vibrant spring menu to set off this awesome line up of wines. Join us on 21 October as we celebrate the show’s star performers, catch up with the judges and winemakers and enjoy a lunch to remember with our great local industry.